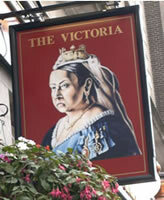 Victoria became Queen in 1837 when she was 18 years old, and married a German prince called Albert three years later. Albert introduced into Britain the German custom of putting up and decorating Christmas trees. He was a great administrator, and helped to organise the Great Exhibition in 1851, a festival of science and industry in Hyde Park which attracted millions of visitors - the Victoria and Albert (V&A) Museum was built using profits made from this exhibition. 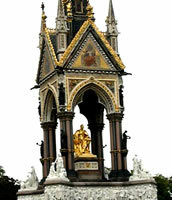 Prince Albert died in 1861: the Royal Albert Hall and the Albert Memorial were built in memory of him. After Albert's death, Victoria always dressed in black. The Victoria Monument in front of Buckingham Palace was built to remember Queen Victoria, who died in 1901. Edward the Seventh ruled from 1901 to 1910: he made many trips to European capitals to try to prevent the start of a European war. By the time of Victoria, most important decisions were not taken by the Queen but by the House of Commons. The Houses of Parliament which can be seen today were completed in 1867. Working class men were given the right to vote, membership of trade unions grew rapidly, and the Labour party was created. Working conditions in factories were improved after campaigns by the Earl of Shaftesbury (Shaftesbury Avenue is named after him), whose work is remembered by a statue in Piccadilly Circus. In early Victorian times life was difficult for many poor children. You can learn about this from some of the stories written by Charles Dickens, such as Oliver Twist or Nicholas Nickleby: Britain/Films/Nickleby. Dr Barnado worked hard to help homeless children by raising money and setting up hostels for them (for details of his life, see: http://www.infed.org/thinkers/barnardo.htm). The charity he established (Barnado's) still exists and continues to help children in need (see: http://www.barnardos.org.uk). Disraeli (who was keen on expanding the British Empire) and Gladstone (who was keen on social reform in Britain) were two of the most influentual prime ministers during Queen Victoria's reign. Many famous novels were written during this time. The Sherlock Holmes stories by Sir Arthur Conan-Doyle and novels by the Brontë sisters (such as Jane Eyre by Charlotte Brontë, and Wuthering Heights by Emily Brontë) are set in this period of history. For more information about British authors and poets, see: English/Reading. There were many advances in science during the Victorian period. You can find out about these at the Science Museum: http://www.sciencemuseum.org.uk. The Italian Marconi developed radio communication in England. Darwin introduced his ideas about evolution. The Scotsman Bell created the first telephone in 1876 in the US. Improvements in medicine helped to prevent the spread of disease. Florence Nightingale was a famous nurse who organised the care of soldiers who were wounded in the Crimean War; after she returned to England she campaigned for cleaner hospitals and better training for nurses. Railways were built throughout Britain during the Victorian period by engineers such as Brunel and Stephenson; many of the bridges, tunnels and stations built in this period are still used today. The London Underground was the world's first underground railway: the first line opened in 1863. Seaside towns such as Brighton and Blackpool became popular places for holidays, as the railways allowed people to travel there cheaply from the industrial towns. 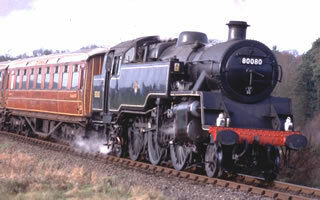 You can find out more about the history of the railways by visiting the National Railway Museum in York: http://www.nrm.org.uk. Canada: Canada (which Britain had gained from the French by capturing Quebec in 1759) was the first country in the empire to be given self-government in 1867 (it was called a dominion instead of a colony). Australia: Many British prisoners were sent to Australian work camps before this was stopped in 1868. The Commonwealth of Australia was created in 1901. New Zealand: New Zealand was taken over by the British in 1840, and given self-government in 1907. Africa: Most of Africa was made into colonies of European countries at this time. British colonies included Egypt, Sudan, part of Somalia, Uganda, Kenya, Nigeria, Ghana, Sierra Leone, Gambia, Zambia, Botswana, Zimbabwe and South Africa. In South Africa there was the Zulu War and two Boer Wars (the Boers were Dutch settlers). Like Canada, Australia and New Zealand, South Africa also became a dominion. India: Since the early 1800s, the British East India Company controlled much of India, employing Indian soldiers. After fighting broke out (known in Britain as the Indian Mutiny) much of the country was put under the control of the British government, becoming part of the British Empire in 1858 (as did Malaya and Burma shortly afterwards). British rule in India lasted until 1947. Hong Kong: The Opium War started when the Chinese tried to stop the British merchants from trading opium. This ended with an agreement for Britain to rule Hong Kong from 1842 until 1997. Ireland: Ireland suffered from famines in the 1840s after a disease affected potatoes. Out of a population of 8 million, almost 1 million people died and another 1 million emigrated to America. Many Irish people wanted independence from Britain.